One of the most profound statements the late Professor Sam Warren Carey (Emeritus Professor of Geology from the University of Tasmania) said to me when I first started researching Expansion Tectonics was: If 50 million believe in a fallacy it is still a fallacy. The point he was making was that the validity of any theory does not depend upon the number of people believing it; hence, an accepted theory may still be fundamentally wrong regardless of how many people believe it is correct. The Plate Tectonic interpretation of global data, for instance, is based on the fundamental premise that the Earths radius has remained constant, or near constant, throughout history. As will be outlined in this paper, this contrasts with an Expansion Tectonic interpretation of the same global data which is based on the fundamental premise that the Earths radius has been steadily increasing throughout Earth history. It should be appreciated from this statement that all modern and historical global data used to substantiate both Plate Tectonic and Expansion Tectonic theories are, in fact, identical. The only reason why Plate Tectonic theory won acceptance 50 years ago was because debate on whether or not Earths radius does or does not change with time was largely hypothetical – since it couldn’t be convincingly verified or measured. Since then there has been a quantum leap in both technology and peoples understanding of our physical Earth, ranging from the introduction of computers, modern data gathering and processing capabilities, advances in software, satellite technologies, media presentation and, of course, increased public awareness of global tectonic principles. The timing of my initial research into Expansion Tectonics was both fortunate and critical. Completion of the published Bedrock Geological Map of the World used in my model studies (Figure 2) coincided with commencement of my research during the early 1990s. Without this world mapping, Expansion Tectonics would have continued to remain in the dark ages. In addition, computer and software technology has also caught up with the need to present Expansion Tectonic Earth models and supporting time constrained data on spherical Earth globes. Modeling of continental plate assemblages has now been completed for 100% of geological Earth history, ranging from the early Archaean Era to the present day. These assemblages have demonstrated a high degree of crustal fit accuracy and, most notably, without the need to arbitrarily fragment continents or dispose of pre-existing crusts by subduction. A formula for rate of change in Earth radius has been established and modeling of physical data completed. This mathematical modeling demonstrates that Earth radius has been increasing exponentially throughout time, increasing to a current rate of 22mm/year. Ancient magnetic poles plus equator have been accurately located on all models constructed. Both poles plot as diametrically opposed north and south poles, enabling the ancient equators and climate zones to be precisely established. Geological, geographical and geophysical data have been investigated on all models. These data are shown to coincide precisely with expected polar and equatorial climatic and biotic constraints. Models have been animated in four dimensions, showing the increase in Earth radius throughout time along with global distribution of selected data sets. Geology (from Greek: gê, “Earth”; and logos, “speech”) literally means to talk about the Earth and is defined as the science and study of the solid matter that constitutes the Earth. To me this definition must also go a step further to acknowledge the rocks making up the Earth are, in fact, a record of the physical processes affecting the Earth throughout its entire history. It is like an open book waiting to be read. To understand and talk about the “rock-record” preserved in rocks you therefore need to understand the language of geology. James Hutton is often viewed as the first modern geologist. In 1785 he presented a paper entitled Theory of the Earth to the Royal Society of Edinburgh. In this paper he suggested the Earth must be much older than previously supposed in order to allow enough time for mountains to be eroded and for sediments to form new rocks at the bottom of the sea, which in turn were raised up to become dry land. Hutton published a two-volume version of his ideas in 1795. Since then our knowledge of geology has extended world wide, with a vast amount of global geological, geographical and geophysical data stored and published for all to use and interpret. The primary concern during my early research into Expansion Tectonics was this modern data has never been tested on models of an expanding Earth. Our perception of global tectonic principles was, and still is, severely biased towards Plate Tectonics at the expense of alternative theories. Many theories have come and gone throughout the past millennia, in particular after the science of geology was formally recognized. The Flat Earth theory, popular in ancient times is now largely historical, but it serves as a useful starting point in understanding the progression of our knowledge about the Earth through history. This concept stems from the limited knowledge of the size and configuration of the Earth in ancient times, and, of course, the limited number of “scientists” or philosophers capable of gathering enough information to make meaningful sense of the knowledge available. By 1915, Alfred Wegener was presenting serious arguments for the idea of “continental drift” in the first edition of his book The Origin of Continents and Oceans. In this book he noted how the east coast of South America and the west coast of Africa looked as if they were once attached. While Wegener wasn’t the first to note this, he was the first to gather significant fossil and geological evidence to support this simple observation. His ideas, however, were not taken seriously by most geologists of that period, who pointed out there was no apparent mechanism for “continental drift” as it was then called. Specifically, they did not see how continental rock could possibly plow through the much denser rock that makes up oceanic crust. It is interesting to note that in 1958 Professor Sam Carey, in researching the concept of continental drift, made scale models of the Earth and demonstrated “if all the continents were reassembled into a Pangaean configuration on a model representing the Earths modern dimensions, the fit was reasonably precise at the centre of the reassembly and along the common margins of north-west Africa and the United States east coast embayment, but became progressively imperfect away from these areas”. Carey concluded from this research that the fit of these ancient continents “could be made much more precise in these areas if the diameter of the Earth was smaller at the time of Pangaea”. With the acceptance of Plate Tectonics, these basic physical observations and conclusions of Carey have been totally ignored. During this same time there were a number of independent thinkers who instead considered the opening of the oceans could be attributed to an increase in Earth radius. Roberto Mantovani in 1889, and again in 1909, published a theory of “earth expansion and continental drift”. In this theory he considered a closed continent covered the entire surface on a smaller Earth. He suggested “thermal expansion led to volcanic activity, which broke the land mass into smaller continents”. These continents then drifted away from each other because of further expansion at the “rip-zones”, where oceans currently lie. This was followed by the pioneering work and publications of Lindemann in 1927, Christopher Otto Hilgenberg during the 1930s, Professor Sam Carey during the 1950s to late 1990s, Jan Kozier during the 1980s, and Klaus Vogel during the 1980s and 1990s. These researchers all showed if each of the continents were physically fitted together they would neatly envelope the Earth with continental crust on a small Earth globe some 55 to 60% of its present size. This coincidence led Hilgenberg, Carey, and Vogel in particular to conclude “terrestrial expansion brought about the splitting and gradual dispersal of continents as they moved radially outwards during geological time”. The perceived failings and short falls of each of these theories, however, eventually led to an acceptance of Plate Tectonic theory in the 1960s. This theory is now credited to have arisen out of the hypothesis of continental drift, as first proposed by Alfred Wegener. Most of us are now reasonably familiar with the concept of Plate Tectonics, whereby the Earths outer crust is said to be made up of a series of large, rigid, plate-like crusts that randomly move over the Earths surface under the influence of mantle convection currents. In the process of random migration, the crustal plates are said to rift, slide past one another, and/or periodically collide to form mountains and subduct beneath continental crusts. The primary assumption and absolute basis of Plate Tectonics is that the radius of the Earth has remained constant, or near constant throughout its 4,500 million year life span. In 1947, a team of scientists, led by Maurice Ewing, utilizing the Woods Hole Oceanographic Institution’s research vessel Atlantis, confirmed the existence of a rise in the level of the sea floor in the central Atlantic Ocean, now known as the mid-ocean-ridge. They also found the floor of the seabed beneath the layer of sediments consisted of basalt, not granite as previously assumed; which is one of the main constituents of the continents. They also found the oceanic crust to be much thinner than continental crust. All of these new findings raised important and intriguing questions about the way we perceive oceanic crust. The most important of which was that the ocean is not simply “oceanised” continental crust covered by sea water, as previously thought. Beginning in the 1950s, scientists, using magnetic instruments (magnetometers) adapted from airborne devices developed during World War II to detect submarines, also began recognizing odd magnetic patterns across the ocean floor. This finding, though unexpected, was not entirely surprising because it was known that basalt – the iron-rich, volcanic rock making up the ocean floor, contains a strongly magnetic mineral called magnetite, which can locally distort compass readings. More importantly, because the presence of magnetite gives the basalt measurable magnetic properties, these newly discovered magnetic sea floor patterns provided an important means to study the distribution of volcanic rocks throughout each of the ocean floors. As more and more of the seafloor was mapped during the 1950s, the magnetic patterns turned out not to be random or isolated occurrences, but instead revealed recognizable zebra-like stripes, found to be symmetrical about the mid-ocean-ridges. Alternating stripes of rock were shown to be laid out in parallel rows on either side of the mid-ocean ridge – one stripe with normal polarity and the adjoining stripe with reversed polarity. The overall pattern, defined by these alternating bands of normally and reversely polarized rock, became known as magnetic striping. Figure 1: Symmetrical magnetic stripping across part of the Atlantic Ocean mid-ocean-ridge. The discovery of this symmetrical magnetic striping pattern suggested a close relationship between the mid-ocean ridges and the stripes. In 1961, scientists (most notably the American geologist Harry Hess) began to theorize that the mid-ocean ridges mark structurally weak zones, where the ocean floor was being ripped apart lengthwise along the mid-ocean ridge crest. It was suggested new volcanic magma from deep within the Earth must rise through these weak zones and eventually erupt along the crest of the ridges to create new oceanic crust. This process, later called seafloor spreading, operates over many millions of years and continues to form new ocean floor all along the 60,000km-long system of mid-ocean ridges now known to be present in all of the oceans. This hypothesis was supported by several lines of evidence. At or near the crest of the mid-ocean-ridges the rocks are very young, and they become progressively older away from the ridge crest. The youngest rocks at the ridge crest always have present-day (normal) polarity. Stripes of rock parallel to the ridge crest were shown to have alternated in magnetic polarity (normal-reversed-normal, etc. ), suggesting the Earths magnetic field has reversed many times throughout its history. By explaining both the zebra-like magnetic striping and the construction of the mid-ocean ridge system, the seafloor spreading hypothesis quickly gained converts. Furthermore, the oceanic crust now came to be universally appreciated as a natural “tape recording” of the history of the reversals in the Earths magnetic field. Subsequent work by the Commission for the Geological Map of the World and UNESCO during the 1980s led to the publication of the “Bedrock Geological Map of the World” in 1991. In this global map, the magnetic striping discussed above was taken a step further. By dating the ages of the ocean floor bedrock at regular intervals throughout each of the oceans, and comparing these ages with the magnetic striping, the ocean floor crust was then displayed according to the ages of the rocks. What this means is the yellow stripes in Figure 2, for instance, located between the younger red stripe and the older orange strip, represents volcanic rocks that were erupted along the ancient mid-ocean-ridges during the Miocene Period, a period of time extending from 6 to 23 million years ago. At that time the younger red and pink rocks did not exist and the two yellow Miocene stripes were joined together along their common mid-ocean-ridge. Figure 2: Bedrock geological map of the world (Commission for the Geological Map of the World and UNESCO, 1991). At this stage there are a number of very important considerations about the crustal mapping shown in the above figures that must be fully appreciated. Firstly, the striping shown in Figure 2 shows that each of the oceans contain a mid-ocean-ridge (currently centred below the pink stripes) and each ocean is increasing its surface area with time. This increase in surface area is shown to be symmetrical within each ocean and the maximum age of exposed sea floor crust is early Jurassic – about 165 million years old (pale blue areas). Secondly, if it were possible to move back in time, each of the stripes shown in both Figures 1 and 2 must be successively removed and the corresponding edges of each coloured stripe must be moved closer together as we move back in time – that is, the volcanic rocks (and similarly the ocean waters) within each stripe must be returned to the mantle where they originally came from. Thirdly, as we move back in time, each of the continents must move closer together in strict accordance with the striping evidence recorded on the map in Figure 2 regardless of which tectonic theory is adhered to. Fourthly, subduction of crusts beneath continents is an artifact of the basic Plate Tectonic requirement for a constant Earth radius. The symmetrical striping evidence shown does not support subduction and subduction is not required if the Earth were increasing its radius. It should also be appreciated that none, or very little of this magnetic striping and age dating evidence was available when Plate Tectonic theory was first proposed. The global distribution of the magnetic striping and age dating was, in fact, completed later in order to quantify the plate motion history and, therefore, the Plate Tectonic history of each ocean. As previously stated, the primary global geological, geographical and geophysical evidence used to quantify both Plate Tectonic and Expansion Tectonic theories is identical. The difference between each theory simply boils down to whether or not the presumed need for a constant Earth radius premise is true or false. In Plate Tectonic theory it is presumed the radius of the Earth has remained essentially constant with time. As new volcanic rocks are injected along the mid-ocean ridge spreading axes the ocean floors widen allowing newer oceanic crust to form. To maintain a theoretical constant radius Earth, an equal amount of pre-existing oceanic or continental crust must then be disposed of elsewhere and returned to the mantle by a theorized process called “subduction”. This subduction process forms the basis for Plate Tectonic theory, and consequentially is essential for maintaining a static radius Earth premise. Alternatively, for an Expansion Tectonic Earth, the very same volcanic rocks injected along the mid-ocean ridge spreading axes again widen and add to the surface area of ocean floor. For an Expansion Tectonic Earth, this increase in surface area of all ocean floors is a reflection of an increase in Earth radius, and there is therefore no requirement for any net disposal of excess crust by subduction processes. For an Expansion Tectonic Earth, prior to about 200 million years ago the modern ocean basins did not exist. At that time all continental crust was united to form a single supercontinent called Pangaea, enclosing the entire ancient Earth at about 52% of the present Earth radius. Instead of the modern oceans, a network of relatively shallow seas covered low lying parts of the Pangaean supercontinent. All of the relatively young ocean floor volcanic crusts, as well as much of the ocean waters and atmosphere, were retained within the mantle, where they originated. While arguments can be given for and against both theories, it is emphasized that the exact same crustal fragments making up both the ancient supercontinents and modern continents can be fitted together precisely, somewhat like a spherical jigsaw, on a smaller radius Earth to form a single supercontinent. The question that must then be answered is, is this empirical phenomenon fact or mere coincidence? Acceptance of Expansion Tectonics as a viable tectonic process is currently envisaged by many researchers to be thwarted by major obstacles, which supposedly “outnumber the evidence in favour”. These opinions are based on very outdated, and arguably emotive and opinionated research carried out during the 1950s to 1970s, well before the advent of modern Plate Tectonics, computer technology, global data gathering capabilities and multimedia communication. Unfortunately, these same outdated opinions are being carried through to recent literature, without proper scientific investigation, regardless of new advances made in Expansion Tectonic research. Expansion Tectonic theory simply removes one primary premise from current tectonic theory –namely the assumption that the Earths radius is constant. By removing this premise we are then in a position to apply correct scientific principles to test whether the global data is, in fact, better explained on an Earth undergoing an increase in radius with time. The completion of oceanic magnetic mapping and age dating of crust beneath all of the Earths major oceans (Figure 2) has provided a very important tool to quantify Expansion Tectonics. This ocean floor mapping has placed finite time constraints on the plate motion history shown in all the oceans extending back to before the Early Jurassic period (to about 200 million years ago). This mapping is used in Expansion Tectonics to quantify both plate reconstruction and rate of crustal generation on small Earth models. 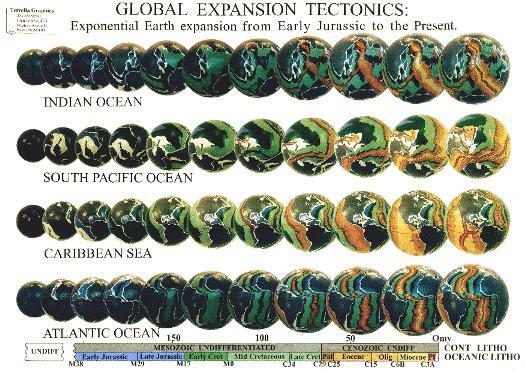 A set of eleven spherical models, extending from the early Jurassic Period to the present, is shown in Figure 3. These models have since been extended back in time to the early Archaean Era (about 4,500 million years ago) and one model projected to five million years into the future (models not shown here). To construct each of the models, successively older geological time stripes paralleling the mid-ocean spreading ridges (Figure 2) are simply removed. Each crustal plate is then restored to a pre-spreading, or pre-extension configuration at a reduced Earth radius along their common plate or continental margin respectively. By successively removing young oceanic crust and reuniting the continental and oceanic plates along their common mid-ocean-ridges, each of the models shown in Figure 3 demonstrates a better than 99% plate fit-together. On these models, during the Triassic period (the time period before the Jurassic), continental crust, as well as sediments deposited around the continental margins, are then shown to envelope the Earth as a complete continental shell at about 52% of the present Earth radius. At that time the sediments along the continental margins (shown as white in Figure 3) formed a global network, representing the location of shallow seas surrounding and on-lapping the ancient continental lands. This unique fit-together of the lands and an ancient sea demonstrates that Expansion Tectonics is indeed a viable process. By modeling oceanic and continental crusts on a reduced radius Earth model it effectively removes the need to arbitrarily fragment continents to maintain a constant Earth radius. It also removes the need to dispose of excess oceanic crust by subduction when opening each of the modern oceans.